The Tip: Refrigerator Iced Tea – don’t do it. Refrigerator iced tea is another term for a cold brewed iced tea. It is similar to “Sun Tea,” the good thing about tea in the refrigerator; seems the bacterium doesn’t multiply in the fridge as much as in the sun. Not a Myth – Tea Can Steep in Cold Water! It is true. Tea just doesn’t steep well in cold water. What you may not know is that it can take 8 or more hours and can be very bitter. We need to discuss flavor. You’re missing out on over 25 % of the flavor and that is the difference between really good tea and just average tea. Cloudy, because you are using cold water, you’re teas may not be pretty – it depends on a lot things. .
Just don’t use your good stuff to make tea this way. For your iced good teas, I would use a more traditional method of making iced tea, even if it means have to take a nap while it chills out. Little Green World will be at Rice’s Market on Tuesday through June 2011. 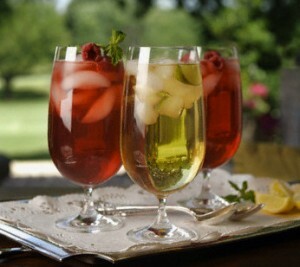 We have on hand many teas that will make a terrific iced tea. This week at the market there were have met many people who love Earl Grey Tea and some that hate it. But I haven’t met anyone who doesn’t like Earl Grey tea iced. With the combination of citrusy Bergamot and malty black tea, our Supreme Earl Grey goes one more step than most teas. If you like iced tea with citrus, then there is a good chance you absolutely love our Supreme Earl Grey iced. Get a free Rooibos Sample when you purchase a teaze from AMAZON. The infuser is medical grade Eastman Tritan and has a stainless steel filter. EASY, EASY EASY to make iced tea – steep, use a tall cup filled with ice.